In the mid-morning heat, the water buffalos’ bells in the surrounding rice fields clinked softly as Mr. Mom Kosal, Chief of the Community Fishery at Koh Pdao, explained the day’s patrol route in the open-air meeting room. The leader of the patrolling team, Mr. Seng Chan Ty, sat attentively listening as Mom Kosal traced the route with his finger on the dusty wooden floor. Mom Kosal and Seng Chan Ty belong to a group of 19 community members on the island village of Koh Pdao in Kratie Province located along Cambodia’s Mekong River that have been placed in charge of managing the community’s fisheries. 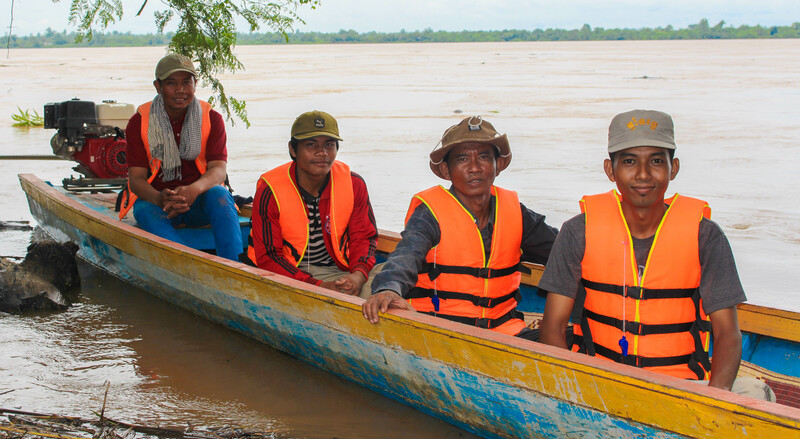 As of 2006, in order to promote effective fisheries and natural resource management, the Cambodian government began supporting local communities to establish Community Fisheries groups (CFis) throughout the country. As Chief, Mom Kosal’s duties include convening all members for monthly meetings and setting the patrol schedule. At this month’s meeting members discussed buying and installing a buoy that would demarcate the dolphin pools and alert fishers the area is off limits for fishing. 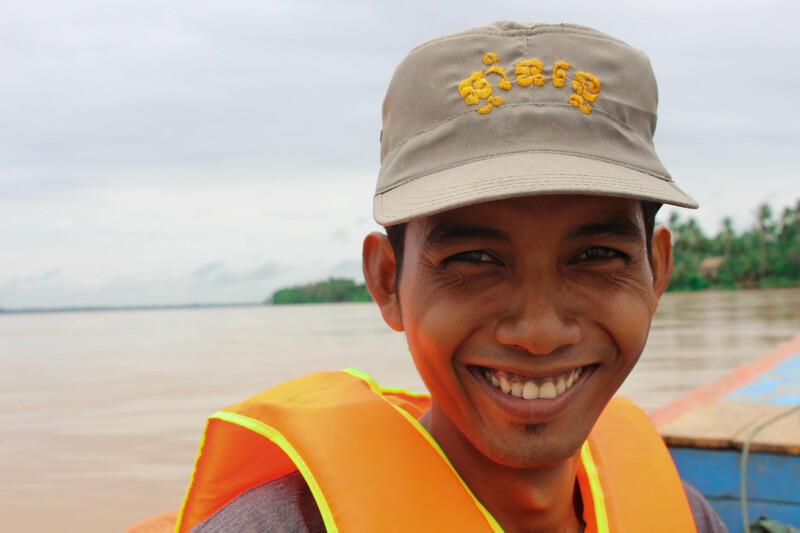 While Mr. Kosal sets the schedule for the patrol, Seng Chan Ty is in charge of the team. When a patrol is scheduled around 7:00 a.m. he will walk around the village collecting patrol members because phone reception on the island is often faulty. The patrol group then heads out to the river on the CFi wooden boat with the express purpose of locating illegal fishers. The CFi’s approach to combating illegal fishing includes a mix of education, warnings, and confiscation of equipment. “When we see people illegally fishing for the first or second time, I warn them and try to educate them about why the practices are harmful. If we see them a third time, I will confiscate the fishing equipment. We then record their name, boat length, and require them to sign a letter promising they will not return,” explained Seng Chan Ty. 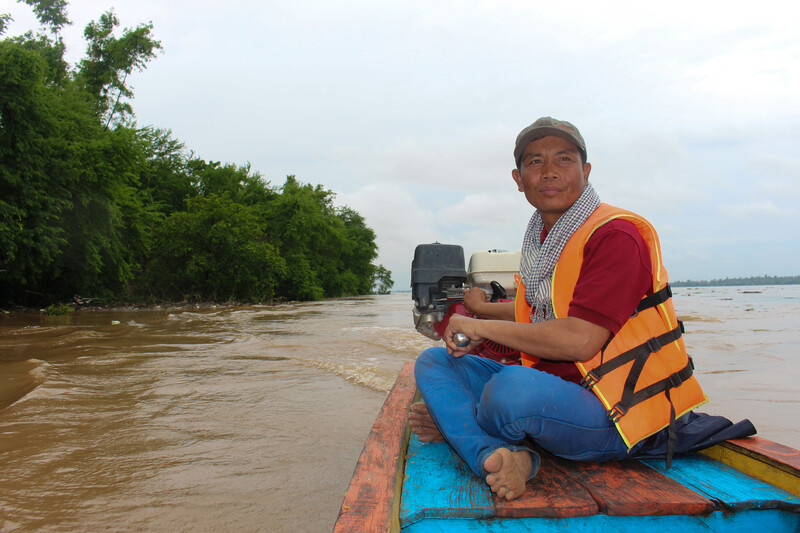 The fact the CFi positions are strictly voluntary emphasizes Mom Kosal and Seng Chan Ty’s dedication to conserving the fish populations upon which their community relies. In addition to their duties in the CFi both men farm rice and raise livestock in order to provide for their families. 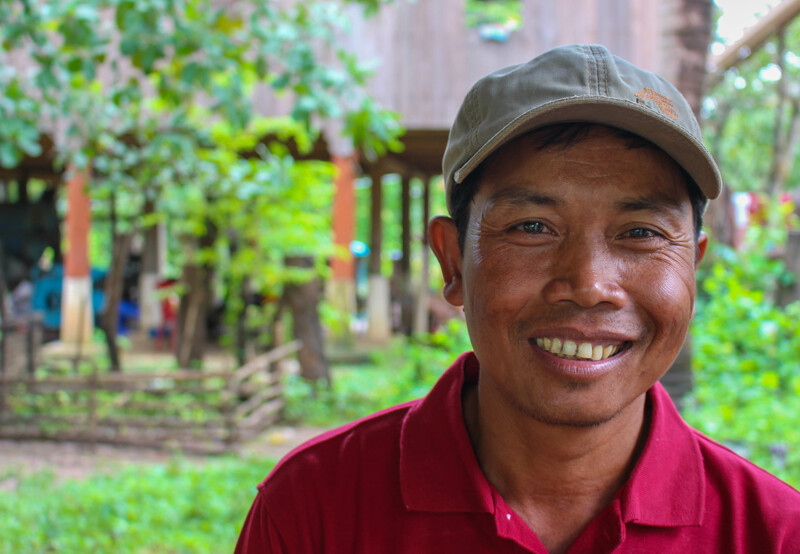 Mom Kosal explained he woke up at 4:00 a.m. today to work in the rice fields. After finishing up with his CFi duties he will take the water buffalo to the fields around noon so they can graze. In the evening he will go to the rice fields again and then come back home to feed the chickens and pigs. Seng Chan Ty explained he has a similar daily routine – rice farming in the morning, caring for livestock, and returning to the rice fields in the evening. While WWF has helped strengthen the CFi over the past couple years by conducting trainings aimed at increasing capacity, challenges to effectively cut down on illegal fishing still exist. For example, necessary equipment such as GPS, life jackets, cameras, and gasoline for the boat can be difficult to obtain. Additionally, both CFi members explained that it is difficult to convince people of the harm gillnets and illegal fishing can cause to the environment. “People now don’t care about the future. They know they can catch many fish with gillnets or other illegal equipment and don’t listen when we explain it can kill dolphins and has been banned by the government,” Mom Kosal lamented. 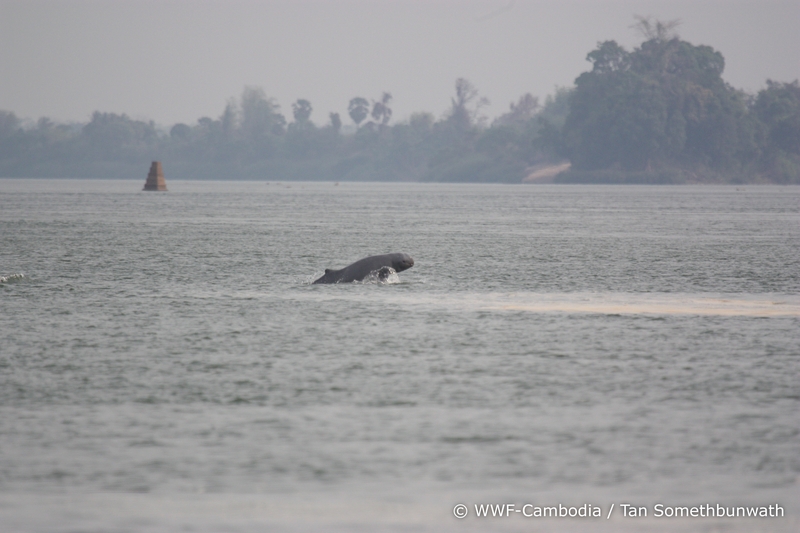 Mom Kosal sees the ultimate goal of the CFi as one where both the dolphins are protected from gillnets and the people of his community always have enough fish to eat. But for now, Mr. Kosal explained he never imagined a CFi would be established in Koh Pdao and feels very happy the community is now able to manage its fishery resources.